Just like a home, your business is often first judged by its exterior. 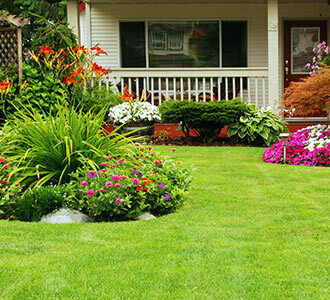 Therefore, you want to give the best impression with a plush lawn and weed-free landscape. To keep that landscape as impressive as you can, you need to bring in a professional service. 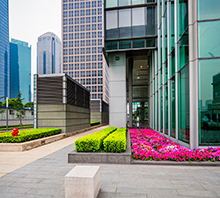 There are numerous commercial landscape maintenance companies out there, but to choose the right one, you should look for the elements that separate the better companies from the average. Commercial landscape firms help maintain, install, and correct issues with your landscaping. They can also help redesign your existing landscape for better aesthetics, provide you with weed control services, and keep your building’s exterior looking fresh and inviting. Landscape Design – You want someone to maintain, but also improve the premises. After all, landscape trends come and go, and you may want to swap your existing landscape design for something more trendy or eco-friendly. Therefore, make sure the company you choose also offers high-end landscape designs and installations. Services You Need – The needs for commercial landscapes are not the same as residential. Services you may need include snow removal, tree planting and removal, weed control, weekly mowing and edging, fertilizing services, flower bed upkeep, bush and tree trimming. Ensure the commercial service you choose can provide these services in a timely manner. Sustainable Services – Today, it is all about being green, and that does not just involve the colour of your lawn. You want a company that helps your landscape turn into a sustainable one, including a water-smart and energy-efficient lawn. Company Qualifications – Check the company’s website, review references, and testimonials, and consider their specific qualifications. Do they have industry certifications? Can they provide insurance and warranty information? Are they affiliated with any professional organizations? Do they have the employees and equipment to handle the job? Will you deal with in-house staff or will they hire sub-contractors to complete the work? Account Manager – As a corporate client, you should receive the benefit of an account manager. The account manager ensures your maintenance is done in time each week but is also your centralized contact for any issues related to your lawn. The account manager may not be the same salesperson that sets up your commercial contract; therefore, you must ask about who will oversee your account. Greenbloom is ready to help with your commercial landscape, design, and maintenance needs. We offer weekly maintenance, high-end landscape services, and attractive, eco-friendly designs so that you can take your building’s exterior to the next level. When you meet with our professionals, we establish a lawn care program based on your specific needs and company budget. Whether you are an industrial park, office, retail location, or apartment complex, let our professionals keep your lawn and surrounding landscape looking its best. Learn more about our commercial lawn maintenance and design services by contacting the team at Greenbloom. You can also call us at 647-500-5263.